Last night's bi-monthly Atlantic Yards/Pacific Park Quality of Life meeting, held at 55 Hanson Place, also aired concerns about the giant green fence and other issues, which I covered separately. Maybe it's the calm before the construction storm. 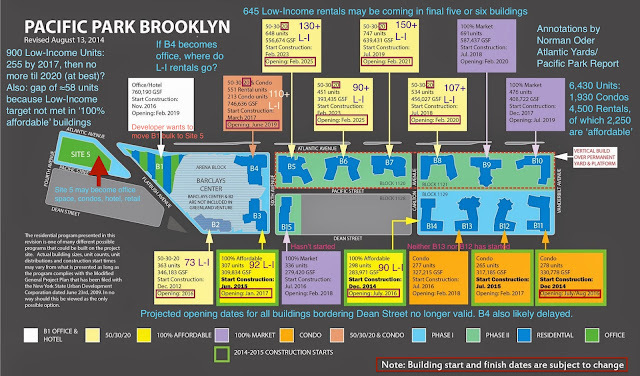 Surely changes in Atlantic Yards/Pacific Park are percolating. But ever since Forest City Realty Trust, the junior partner in Pacific Park, last November announced that market conditions put development on hold, there hasn't been much positive news. Last night, a representative of the joint venture Greenland Forest City Partners (GFCP) had exactly zero information about any upcoming construction starts, despite announced--but paused--plans for two towers, 664 Pacific (B15) and 615 Dean (B12). Not only that, Forest City New York's Ashley Cotton expressed doubt that any market-rate building could be built, given the current state of the 421-a tax break, and essentially acknowledged that the joint venture had given up on its effort to attract investors--or buyers--for three project parcels. Cotton said she had no plans to share. "We have just gotten through 421-a," she said of the revised state tax break, which does not extend to Brooklyn condos--which were planned on those sites. "We are in the middle of constant back-and- forth related to all our buildings, in the new era of 421-a today." Cotton said that not only is the old 421-a gone, the rules that governed a project-wide tax abatement are gone, too. So there's no longer is there a carve-out allowing 421-a benefits for a market-rate building as long as the overall project meets affordable threshold. "We're obviously seeing that a full market-rate building is probably not a reality anymore, given that we don’t have a project wide abatement program," Cotton said. So GFCP is doing what any developer does, she said, analyzing the financial dynamics of each site. Cotton acknowledged that the developer had that flexibility, but said they're analyzing the revised law: "we got a new 421-a, we may decide it’s better, or worse." Does GFCP have any update on plans for Site 5, which could contain a giant two-tower project catercorner to the arena, on parcels now occupied by P.C. Richard and Modell's? What about marketing three sites? In May, I wrote that the uncertainly about 421-a and condos surely has hindered the effort, announced more than a year ago, to market three buildings containing condos--B12, B13, B4--to outside investors. Veconi asked if they were still being marketed. "That’s not really the right way to think about it," Cotton responded. "As a JV [joint venture], are we always interested in seeing what deals are out there? Yes. Is there like a [marketing] book on the street? There was once... We’re looking to make the best deals we can, at any given time, to make sure, a) we meet our obligations, and b) build buildings that make sense." Of course the obligations may be malleable, as in the example of affordable housing.